Parallelizing loops with Matlab’s parfor might generate unexpected results. Users beware! Java object sizes are not reported by Matlab, but we can still estimate them using two free external utilities. The clear function has some non-trivial effects on Matlab performance. The import function can be used to clarify Java code used in Matlab. 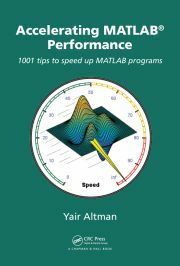 Copy-on-write and in-place data manipulations are very useful Matlab performance improvement techniques. Several alternatives are explored for dynamic array growth performance in Matlab loops. Preallocation is a standard Matlab speedup technique. Still, it has several undocumented aspects. Matlab’s internal memory structure is explored and discussed. Editing Matlab arrays in-place can be an important technique for optimizing calculations. This article shows how to do it using Mex.